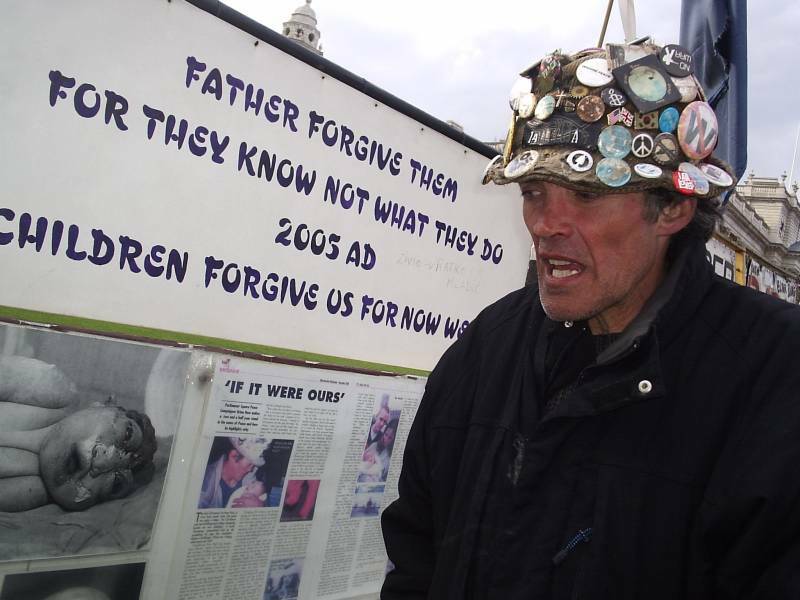 Since 2nd of June 2001, Brian Haw has been sitting in front of the parliament building in London, maintaining a vigil for the victims of the Iraq policy of the USA and England. He expresses his protest against war and its consequences for the civilian population with texts and pictures that he partially collected himself and partially received from supporters from all around the world. He himself sits in front of this display, 24 hours a day, seven days a week, for the last 1776 days, “as long as it takes”, always in the view of the warmongers across the street. To get rid of him, the British government passed a new law as part of the Serious Organised Crime and Bill Act in April 2005 that seriously restricts the British people’s freedom of speech, criminalising protest and demonstrations within one kilometre from Parliament Square without permission from the police as “serious organised crime”. However, Brian Haw was exempt from this ban by the High Court on 29th of July, since his protest had started four years before the law was passed. He is now the only Briton who can express his opinion publicly on Parliament Square. Last Monday, Saba and me visited Brian Haw in London and spent some time with him. We’ve met a man, whose principles and convictions are more worth to him than a regular life. A man who is prepared to bear the consequences of his conviction, as long as necessary, and who does not accept his freedom of speech to be restricted by a government that would rather draw the curtain over its failure. This post is dedicated to a man, who does not watch while our political leaders abuse their power and, under the disguise of democracy and human rights, betray even those values. GO ON BRIAN HAW!!! After both Nokhutula and Andree made it clear to me that they do not appreciate my project in Zimbabwe, and after they influenced the atmosphere in Mbare where I worked in a way that it was impossible to carry on my project, I took the consequences and returned to UK on 29th of March. I will go to India on 3rd of May and start a project there in Delhi and Kolkata, dealing on women’s and children’s situation in India. Part of this project will also probably still be on the HIV/AIDS issue. Within the next days I will publish an article in the category Zimbabwe to tell about my encounters with the people there. Despite all that happened, this country and its people will always take a special place in my heart.